Early in the morning on Saturday, 26 May 2018, the AWAKE collaboration at CERN successfully accelerated electrons for the first time using a wakefield generated by protons zipping through a plasma. A paper describing this important result was published in the journal Nature today. The electrons were accelerated by a factor of around 100 over a length of 10 metres: they were externally injected into AWAKE at an energy of around 19 MeV (million electronvolts) and attained an energy of almost 2 GeV (billion electronvolts). Although still at a very early stage of development, the use of plasma wakefields could drastically reduce the sizes, and therefore the costs, of the accelerators needed to achieve the high-energy collisions that physicists use to probe the fundamental laws of nature. The first demonstration of electron acceleration in AWAKE comes only five years after CERN approved the project in 2013 and is an important first step towards realising this vision. AWAKE, which stands for "Advanced WAKEfield Experiment", is a proof-of-principle R&D project investigating the use of protons to drive plasma wakefields for accelerating electrons to higher energies than can be achieved using conventional technologies. Traditional accelerators use what are known as radio-frequency (RF) cavities to kick the particle beams to higher energies. This involves alternating the electrical polarity of positively and negatively charged zones within the RF cavity, with the combination of attraction and repulsion accelerating the particles within the cavity. By contrast, in wakefield accelerators, the particles get accelerated by "surfing" on top of the plasma wave (or wakefield) that contains similar zones of positive and negative charges. Plasma wakefields themselves are not new ideas; they were first proposed in the late 1970s. "Wakefield accelerators have two different beams: the beam of particles that is the target for the acceleration is known as a 'witness beam', while the beam that generates the wakefield itself is known as the 'drive beam'," explains Allen Caldwell, spokesperson of the AWAKE collaboration. Previous examples of wakefield acceleration have relied on using electrons or lasers for the drive beam. AWAKE is the first experiment to use protons for the drive beam, and CERN provides the perfect opportunity to try the concept. Drive beams of protons penetrate deeper into the plasma than drive beams of electrons and lasers. "Therefore," Caldwell adds, "wakefield accelerators relying on protons for their drive beams can accelerate their witness beams for a greater distance, consequently allowing them to attain higher energies." 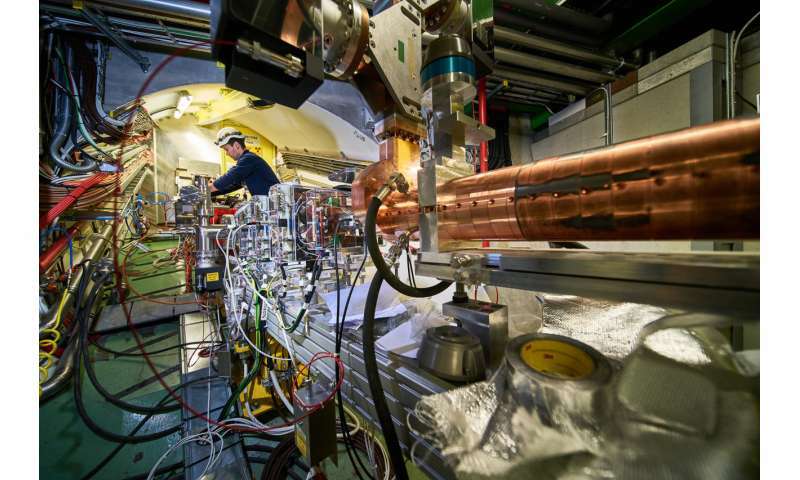 AWAKE gets its drive-protons from the Super Proton Synchrotron (SPS), which is the last accelerator in the chain that delivers protons to the Large Hadron Collider (LHC). Protons from the SPS, travelling with an energy of 400 GeV, are injected into a so-called "plasma cell" of AWAKE, which contains Rubidium gas uniformly heated to around 200 ºC. These protons are accompanied by a laser pulse that transforms the Rubidium gas into a plasma – a special state of ionised gas – by ejecting electrons from the gas atoms. As this drive beam of positively charged protons travels through the plasma, it causes the otherwise-randomly-distributed negatively charged electrons within the plasma to oscillate in a wavelike pattern, much like a ship moving through the water generates oscillations in its wake. Witness-electrons are then injected at an angle into this oscillating plasma at relatively low energies and "ride" the plasma wave to get accelerated. At the other end of the plasma, a dipole magnet bends the incoming electrons onto a detector. "The magnetic field of the dipole can be adjusted so that only electrons with a specific energy go through to the detector and give a signal at a particular location inside it," says Matthew Wing, deputy spokesperson of AWAKE, who is also responsible for this apparatus, known as the electron spectrometer. "This is how we were able to determine that the accelerated electrons reached an energy of up to 2 GeV." The strength at which an accelerator can accelerate a particle beam per unit of length is known as its acceleration gradient and is measured in volts-per-metre (V/m). The greater the acceleration gradient, the more effective the acceleration. The Large Electron-Positron collider (LEP), which operated at CERN between 1989 and 2000, used conventional RF cavities and had a nominal acceleration gradient of 6 MV/m. "By accelerating electrons to 2 GeV in just 10 metres, AWAKE has demonstrated that it can achieve an average gradient of around 200 MV/m," says Edda Gschwendtner, technical coordinator and CERN project leader for AWAKE. Gschwendtner and colleagues are aiming to attain an eventual acceleration gradient of around 1000 MV/m (or 1 GV/m). AWAKE has made rapid progress since its inception. Civil-engineering works for the project began in 2014, and the plasma cell was installed in early 2016 in the tunnel formerly used by part of the CNGS facility at CERN. A few months later, the first drive beams of protons were injected into the plasma cell to commission the experimental apparatus, and a proton-driven wakefield was observed for the first time in late 2016. In late 2017, the electron source, electron beam line and electron spectrometer were installed in the AWAKE facility to complete the preparatory phase. Now that they have demonstrated the ability to accelerate electrons using a proton-driven plasma wakefield, the AWAKE team is looking to the future. "Our next steps include plans for delivering accelerated electrons to a physics experiment and extending the project with a full-fledged physics programme of its own," notes Patric Muggli, physics coordinator for AWAKE. AWAKE will continue testing the wakefield-acceleration of electrons for the rest of 2018, after which the entire accelerator complex at CERN will undergo a two-year shutdown for upgrades and maintenance. Gschwendtner is optimistic: "We are looking forward to obtaining more results from our experiment to demonstrate the scope of plasma wakefields as the basis for future particle accelerators." It would be easier to merely replicate biological proton ATP-ase's containment field and conformational change drivers, lengthen it. Of course, you can't tell a stupid physicist anything. I'm sure someone is trying to figure out how to get funding for two of these firing from opposite directions at the target. If you can't calculate point by point; suggest you are playing.